It was almost exactly one year ago that Jonathan Mann won the Bing Jingle contest with his, well, awful song. At the time, no one seemed to know who he was and I was perhaps a little harsh in knocking him down for it. But he got me back — not with the song he wrote about me, but rather the creative tear he’s been on recently. You could make an argument that no one has benefitted more from Apple’s iPhone 4 antenna issue — as Mann wrote a great song about it, which Apple then played at their press conference as Steve Jobs took the stage. Mann then followed this up with a brilliant song about Jobs. Today, he’s back again. In case you didn’t open a web browser yesterday, there was a little incident involving a JetBlue flight attendant. 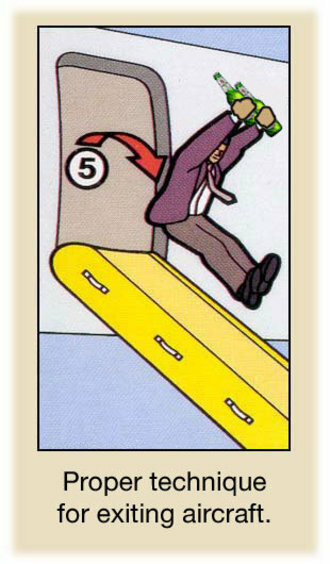 Specifically, 38-year-old Steven Slater got pissed off at passengers after his flight landed in New York City, so he grabbed the airplane intercom, started swearing, then grabbed two beers from the food area, opened the emergency door of the plane, and slid down the emergency slide. The news exploded on the Internet, with Facebook pages being made in support of Slater, as well as video re-enactments. And, of course, he’s been the top Trending Topic on Twitter (as has “flight attendant”) for two days running now. And now he’s getting the Mann treatment as well. Slater got out of jail last night, hopefully he enjoys his song. It’s not exactly safe for work, but it’s awesome. We’re proud of you, Mann — but where’s the Delta song?